Up to 40% of the sea life caught in fishing nets is wasted "bycatch," putting pressure on struggling species. Innovators have proposed ways that LEDs can help reduce the waste. Drift-net fishing is extraordinarily wasteful. Everyone knows this, most especially fishermen. Nearly half of what comes up in nets is returned lifeless to the sea: turtles, lobsters, birds, dolphins, sharks, even whales. The "wrong" species -- ones that are otherwise usable but not what is sought on this particular fishing run. Fish too young and small to use. It is the latter category that is particularly damaging to sustainability. Population collapse by overfishing would be bad enough, but collapse due to bycatching would be tragic. Conservationists, academics, and increasingly fishermen themselves are seeking ways to remedy this unsustainable situation. Enisa magazine ("showcasing environmental solutions in action") recently highlighted several of these initiatives that involve LED illumination. This solution has been tested in South America and the Pacific, and is being investigated for US fisheries. Turtle Lights for Gillnets was an idea put forward in the World Wildlife Fund's annual "Smart Gear" international competition in 2011, and it won a runner-up award of $10,000 in that year. The designers thought of repurposing commonly available lights used to attract fish -- either LED or chemically based -- and put them to use warning off turtles instead. Lights are attached to fishing nets and tuned to frequencies that the turtles can see. In trial runs in Mexico, Peru, and Indonesia, the lights reduced sea turtle bycatch by as much as 60%. This possibility is in the idea stage. John Wang, the project leader of Turtle Lights for Gillnets, began to notice that light affected different fish in different ways. After some experimentation, he is "working on illuminating nets with ultraviolet light to steer hammerhead sharks away," Enisa reports. British designer Don Watson learned about the tragedy of sea fishing bycatch five years ago, and he has been working on the SafetyNet idea ever since. This video explains the several levels of bycatch protection built into the SafetyNet. The one of interest here is open, ring-shaped LED lights that reinforce and hold open the mesh in a section of the net where the mesh is small. 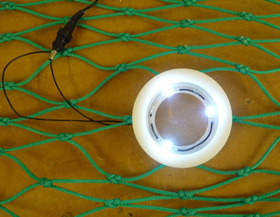 The LED rings flash to attract the attention of small fish, which upon investigating them find they can use them to escape the net. Larger fish don't get the same opportunity. The LEDs can be powered either by batteries or by a built-in dynamo that uses the energy of the net's movement through the water to generate electricity. The SafetyNet also incorporates another idea described in the Enisa report: large openings at the bottom of the net to allow cod to escape in haddock fisheries. This idea was pioneered by the Eliminator Trawl, which won the WWF Smart Gear challenge in 2007. The principle is that the cod instinctively swim downward to escape danger, whereas haddock swim upward, where the net's mesh is tighter. Cod bycatch is reduced by 80%. A third conservation idea incorporated into the SafetyNet is runners to stand the net off from being dragged across the sea floor, reducing damage to delicate marine habitats. Dan Watson will get to try out his SafetyNet for the first time in the open Atlantic before the end of 2014. A commercial trawler will take him off the UK's southwestern coast to do some real, sustainable fishing. It always lifts my spirits to see LED technology being put to such ecologically worthwhile uses.